Originally published under the title, "ISIS Pushes Farther into Syria." 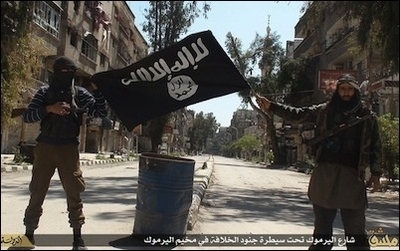 ISIS fighters pose for the camera in the Yarmouk Palestinian refugee camp in suburban Damascus. The conquest by the Islamic State of the Yarmouk Palestinian refugee camp near Damascus confirms the resilience of the jihadis and is an indicator of their current strategy. Islamic State has lost considerable ground in Iraq, with the recapture of Tikrit constituting its latest setback. IS has no real response to coalition air power, when it is combined with a competent and determined ground force. This was first demonstrated in the organization's defeat at Kobani in January, and it is now becoming apparent in Iraq. ISIS is adept at concentrating its forces and planning beyond the merely local and tactical. When I interviewed two ISIS fighters in the border town of Kilis in spring, 2014, I asked them about the reasons for this retreat. "If there are powers against me, I have to retreat and protect my back," one of them told me. "And perhaps in the future I will return again." As ISIS contracts along its easternmost frontier in Iraq, it is seeking to expand to the south and west in Syria. To the west, IS is challenging other Islamist and jihadi forces, which are no less anti-western than the Islamic State. Indeed, Nusra is quietly building a parallel de facto jihadi sovereign entity across Idlib and Aleppo provinces. The al-Qaeda franchise recently conquered Idlib city, giving it control over a provincial capital, as IS controls Raqqa city. Nusra has already begun to introduce its own brutal brand of Sharia law into Idlib, including the practice of public executions for a variety of crimes. In the Damascus area, meanwhile, the Islamic State is battling against a coalition of Palestinian forces supported by the Assad regime. The most significant element among the Palestinians seeking to challenge IS in Yarmouk is Hamas. The Hamas fighters in Yarmouk go under the name of "Aknaf Beit al-Maqdis." They are cooperating with the rebel Jaysh al-Islam in pro-regime forces and of course there will be no western help in that battle either. Despite setbacks in Iraq, the Islamic State is not being seriously degraded, nor is it anywhere close to being destroyed. What all this means is that while it is suffering real setbacks in Iraq, the Islamic State is at the present time not being seriously degraded, nor is it anywhere close to being destroyed (the two goals of the west with regard to the jihadis).